Today was the first day of the Chillai Kalan and it was a nice and pleasent 4 degree C I decide to look again for something i had looked for before but was unable to locate the exact place. 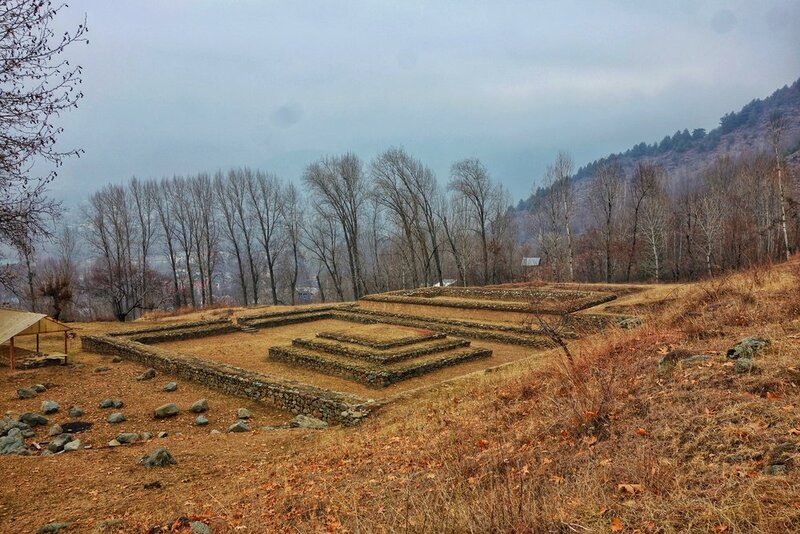 It was the excavated site of an almost 2000 year old Buddhist Monastery on the outskirts of Srinagar and I had seen terracota Tiles from the same site at the SPS Museum and they showed a very high level of craftsmanship. I drove to the point where the car would go and walked up the hill through a village as pointed out by a Government board which showed an arrow towards the location.I had followed this twice before but had just reached a place which looked ancient but couldn’t really make out anything. Same thing happened today, the board says Harwan Ancient Buddhist ruins but all i could see were rocks and a water treatment plant. I Googled and got some images which looked totally different from where I was but I could make out that it was the same hills in the background. So i looked around again and again. An old man sitting watching his sheep noticed and after 10 minutes asked me what I was looking for. I told him and he pointed upwards to a spur where I could see a couple of Chinars. He said go there as that is where its at. He also told me that the board is at a wrong place and the very few people who come cant find it. He asked me which Government Department I was from. I smiled and said I dont belong to the Government. He asked why I wanted to go there then ? I said I wanted to click some pics. He stared at me for a couple of seconds and then just nodded his head and pointed his stick towards the track that would lead me up. I started walking up. It was kinda cold and dreary. Just grey and brown. And then first I stumble on the ASI Boards saying its a Protected Monument and another one describing the significance of the site (which I will come to later). There wasnt a sole in sight and in the background the hills of the Zabarwan were covered in scanty snow. And then i came upon the site. It was surreal. A well laid out platform of a Monastery and a Stupa base at the center. This was the first tier. There were I assume multiple tiers as was the norm that time for Buddhist Monasteries in Kashmir. The much visited Pari Mahal was also built on the ruins of one such Buddhist monastery. Kashmir used to be a stronghold of Buddhism till it declined and all the Buddhist monasteries and structures just wasted away. After this I climbed up to the what was the Upper tier. As soon as I got there I realized that I had company. Not humans but three Jackals doing their Jackal things on the Upper Tier. They were as surprised to see me as I was to see them. I think hardly anyone ever visits so the Jackals felt at home and this is actually almost in Dachigam so I was relieved it was Jackals and not Bears. Anyway they ran away once they saw me. The Upper Tier also had a Temple type round structure and a courtyard which was covered with the same Terrocota Tiles I had seen at the the Museum. To cut it short this also looked quite exquisite for something supposedly 2 thousand years old. On the back towards the Mountain were other remains of tiers and one can only imagine how big this whole place used to be once upon a time. Now the significance. It is said the Fourth Buddhist Council was held in Harwan around somewhere here and this weel could be the site. It was convened by the Great Kushan King Kanishka and it is said that it was in this council Buddhism was divided into the two sects, Mahayana and Hinyana. There was also a Fourth Buddhist Council held earlier in Sri Lanka and consequently the completed Cannon was taken as manuscripts to Laos, Cambodia, Burma and Thailand and hence Hinyana or Thervada as it later developed into was/is prevelant there. At the Kashmir Council convened by Kanishka apparently 500 monks assembled and these includedthe Master Nagarjuna who apparently resided at this very place. After the Council her the Monks went North to Tibet, China, Central Asia and Mongolia. And subsequently it spread the Mahayana school of thought to these countries. This shows what an important place Kashmir was in the spread of Buddhism and more so this exact location which I stood at with some reluctant Jackals for company. The next Buddhist Council was held 1900 years later but this was the last Council of the ancient times. If all that I have conjunctured is true this should be one of the most important Buddhist sites in the whole world. It just cant be anything less. That sadly very few know about this place and even fewer visit is even more bizarre. I got the same feeling when I saw the Gilgit manuscripts (I made a post about the Gilgit Manuscripts. Link given below)but it was stronger. This is an absolute gem of Kashmir and its ancient civilization but sadly today (or maybe not that sadly) its the playground of Jackals. I hung around, got a few fleeting shots of the Jackals, got pics of the place, shot a video and after an hour I noticed that the Jackals were watching me anxiously. I just blew a kiss towards them and left.